This cheap, probably free, material can be a boon to the financially hard pressed railway modeller. Even for those with plenty of the readies it is still a good material to use. The first thing to do is to get the raw material graded. I use a flour sieve for the finest grade and then two of my wifes colanders, each having different sized holes, to give me three basic grades. When it comes to colouring the sawdust I have found the simplest way to colour small or large quantities is to use a water dye. Dylon is the brand I use. It comes in small metal tins and is very strong so be careful when handling it. I use a foil container, about 6 or 7 inches by 3 or 4 inches and a couple of inches deep as this holds a surprisingly large amount of sawdust when it is soaked in water. Put about a half inch of water in the container and then shake a small quantity of the dye into it and stir gently until well mixed. It is then a simple matter of adding sawdust until it has soaked up all the dye. Remember that this soaking wet mixture is going to take a fair bit of drying so don't be tempted to mix up too much at once. 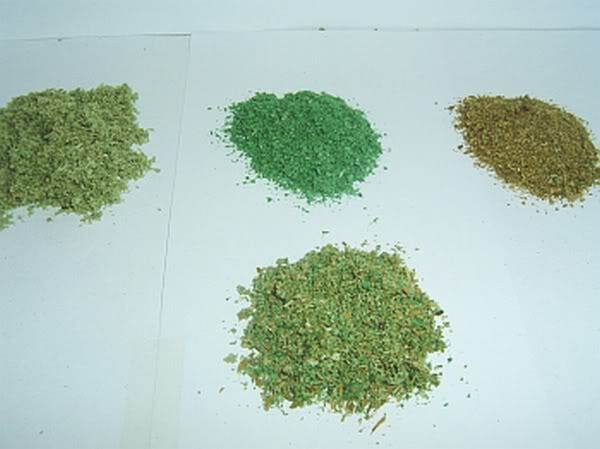 Different shades of green dyed sawdust for use as scatter. Grass land, hedges, tree foliage cover, bush cover. The same sawdust dyed brown is good for ballast, soil, mixed with green for dryer areas under trees. Let your imagination have full reign here. The above picture shows the medium coarse grade of dyed sawdust. When choosing your dye colour try not to pick shades which are very bright as they won't look natural on the layout. I have included a heap of bright green in the photograph and I think this illustrates what I mean, especially in the enlarged picture. A tin of green dye, for example, will give you many shades of green just by varying the water/dye ratio. A few small test samples will soon show you what I mean. The same applies to all the colours. Mixing the various shades of dyed sawdust will also give you many different effects, again a little bit of experimenting here goes a long way. You are here: Your Model Railway Club > Reference Area. > Bob's Barchester > Barchester Sawdust and it's Uses.